Providing you the best range of automatic wiro inserting & closing machine, wiro binding machine, automatic spiral binding machine, a4 electric spiral binder, spiral wiro binding machine and hand operated creasing machine with effective & timely delivery. Fully Automatic Loop Counting and Cutting. Fully Functional Control Panel for all settings. 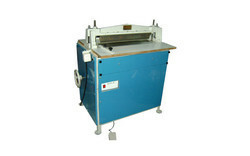 Wiro Binding Machine operated by Motor. Wiro Punching available for 2:1 and 3:1 patterns in different sizes of Holes. For Punching Holes of Spiral,Wiro,Comb and other type of Holes. Multiple patterns of Hole can be done with help of Die sets. Easiest Method for Die changing take less time. Available in foot Operated Mechanical or Magnetic Clutch Models. best results and quality. Various die sets can be used on same machine. 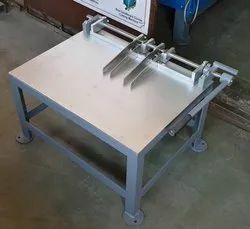 Size 18" x 18" x 36"
Ajya Mistry And Sons Heavy Duty Semi Automatic A4 Size Spiral Binder Machine for Carrying out large loads. 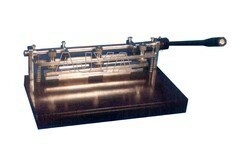 This Machine runs on 0.5 HP Single Phase Electric Motor. And can be operated by Electro Magnet Clutch. Main feature of this clutch is fast performance with trouble free and maintainance free life. Machine is supplied with A4 Size 4mm Spiral Hole Punching Die. Machine capable of changing Die as per requirement. Machine Dimension 30" x 30" x 36"
Full A2 Spiral , Wiro, Comb Binding Special Die for Desk Calendars and Wall Calendars. 2 to 4mm Card Board Hole Punching possible. Three Hole, Four Hole, File Holes. Machine capable of die changing for various work of book binding. Single Line creasing for Brochures can also be done. Runs on 1 HP Single Phase Electric Motor with Speical Electro Magnet Clutch for trouble free and noiseless work. 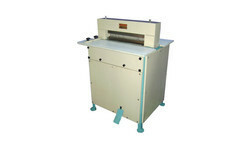 Single line creasing machine available in hand operated model. Maximum paper size is A3. Good creasing quality for brochure creasing, paper creasing etc. Full metal heavy body with no breakable part. We Introduce our selves as a quality producer of Die sets for Wiro Hole Punching for Notebooks and Calenders. We make die from quality material and Our manufacturing technique makes it durable and good quality. Punches are made from harden HSS and Also all plates are of stadard Steel. Available in customize sizes from 12" to 24". 2:1 Available in 5 mm x 5.5 mm , 6 mm x 6 mm etc. Also If any special sizes required we can make it. Also We give die sets for Ready Made Presses. Ajya Mistry And Sons Pneumatic Wiro Closer Machine is developed for specially used in book binding and calender Industry. This Machine can be used with existing compressor or You can Buy Air Compressor with Machine at extra cost. Desktop and Table Models available. 1 HP Compressor Required to Run Machine. Adjustable Hight for Various Wiro Sizes. Easy to Use and Quick Changing of Sizes. Case Maker guide table for making cases for diary, boxes , etc. Separate table helps to work faster independently with gluing machine. More speed of work than regular case maker machine.Available in 18 x 24 , 24 x 36 sizes. Customize sizes and features possible. Looking for Book Binding Machine ?